We saw here that heliocentric Ceres caused gold to top on 11/27 and silver to top 2 days later as Ceres reached gold’s 72° and silver’s 36° harmonic, respectively. On December 9, a similar configuration will occur for the S&P, as geocentric Ceres crosses the S&P’s 36° harmonic. This should cause a significant reversal. Personally i would be wary of risk assets(commodities) here. Hi Beetlejuice, I see what you’re saying but pull your chart back a couple years… there is a head & shoulders forming. The loss of the petrodollar is what’s going to kill us. I have no idea what is keeping this afloat but it looks exhausted to me and a decent break lower could see it test the 97.5 USc level and the lower boundary of the large triangle on he weekly. I went long oil earlier today. I think we have a nice low-risk set-up because it’s at the bottom of an up-sloping channel, and back-testing a down-sloping channel it just broke out of. I usually use /qm which is mini-futures. That way I can scale in and out. huh? The high today is 1413.75? Don’t forget that Anthony uses some Australian proxy to the S&P so the numbers don’t match exactly. ah ok. Perhaps with an Aussie accent, it gets there. Pretty impressive to nail the exact high of the day. Hi SBW, my long term view into 2013 is bullish. I’m still thinking early January peak. New highs eventually next year..Could even see new all time highs..
ZZ: Do you agree with there will be a big drop after January peak? ZZ: still think we will go sideway to down from now on to 12/14-15? 1420 looks like a real strong resistance. Yes, I think a pullback to 12/14-15 would be a good spot to start loading up for Santa. The INDU correlation low is the 19th, but the SPX correlation is a better indicator and that one is supposed to hit around the 15th. How do you find these correlations in the past history? Is it manual going through the years of data and looking for parts that fit current action? I look at high and lows that are of equal distance on a 100 year chart. Then I look for the count in the middle to try and locate the possible pricing pattern that correlates with where we are today. It can be hard to locate exact days but usually it finds which way the trend is going. E.W.-wise, from 11/15 low to possible January high, wave structure will be an ABC bounce up. I think we are seeing b of B today. c of B likely on 12/14-15 at around 1380. Then C wave up will bring us into early January top. With SE_Aspectarian I calculate geocentric Ceres 36° Transit to Natal Ceres (of 03/04/1957) and I get 04/24/2012. Heliocentric Ceres 36° Transit to Natal Ceres (03/04/1957) is 11/15/2012, the recent major low in stocks. I use the natal chart only to set the fixed harmonics for S&P (the pentagram). Then I watch for planets to cross the harmonic points. So this prediction has nothing to do with Ceres’ natal position. Platy, I tried to find ceres-longitudes, but …? Do you have a link where i ca find it (goe en helio). Longitude is calculated counter-clockwise from 0°Aries. Keeping in mind that 12/9 is a Sunday, your short opportunity is likely tomorrow then……I stopped out so looking to reload. I think I will do so before the end of the day and hold it till the 11th, reload after the FOMC meeting to hold until the 17th. Tomorrow or Monday would be my expectation. 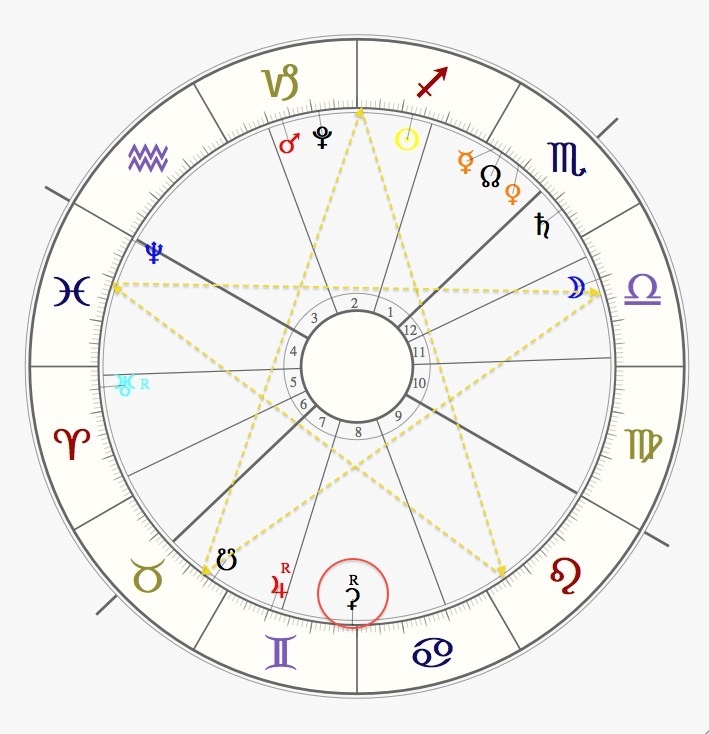 Platy – tomorrow (12/7/) is also Mars 36 harmonic right? I have 12/5 as Mars 36. It was a low. many times we see a high at the new moon , so combined with this aspect we could be looking voor a high ?? New Moon is on the 13th. This aspect should be stronger than a New Moon. Interesting Platy. I thought I had read that Ceres is not as important as Mars in the other thread, but I could be mistaken. The further out the planet is, the more important it is. PLaty – as always can you please post a historical chart too. If I get time I will do that. SPX is slightly down from Nov 30th off the high of 1423. Why do you think it will be a drop? Because Ceres is pretty significant (more important than Mars for example) so we should be looking at the longer term trend. It’s no guarantee, but these are the odds. Hi Platy, do you still see more downside coming for the miners? wondering if I should reposition my self. I am seeing signs that the bottom is in. Today’s low should be a good stop. Great thx Platy…I didn’t put any stops in place for NUGT as I found I kept stopping out…only thing I’m concerned about is Anthony’s bearish outlook on the miner’s as posted yesterday. Yeah, I’m concerned about that too! This reversal, you mean a fall on S&P? Hi John, it is looking to be a top, yes. This entry was posted on December 6, 2012 by platypusfoot.